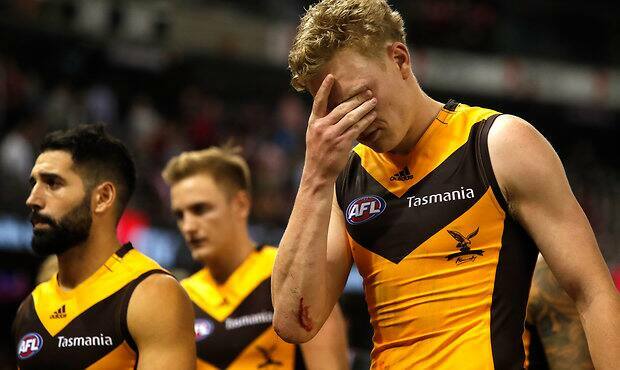 “They’re strange games at the minute,” the Hawthorn coach said. “I reckon six of the nine games, in pretty good conditions, are decided by 10 goals each, in a competition where we’re trying to get teams to score more. All the changes we’ve made to the game and we’re scoring less. “That’s what’s hard to foresee as a competition and hard to foresee as coaches and players, to see what changes we’ll make. The Hawks have failed to hit that target in every match thus far – booting 12, 13, 13 and 10 – but it’s hardly a problem unique to them. “We need to work out a way (to kick more goals), as do other sides, because there’s a lot of games being decided by small margins with not many goals being scored,” Clarkson said. “Who would’ve thought the Pies and the Dogs would have the game that they had? Ninety uncontested marks between them in the first quarter on Friday night, 10 inside-50s to nine, one goal to zero. “The game is in a really, really interesting phase and everyone’s trying to work it out. Thus far, they haven’t worked. “Everyone expects that these gurus in the game that can look into the crystal ball and forecast what goes on,” Clarkson said. “Now that they’ve changed the kick-in rule for instance, there’s more goals scored on returns than there are kick-ins. No one had the foresight to expect that that was going to happen. “When you make nine or 10 changes, it’s going to be quite significant, but no one really knows which one’s going to change the game or whether it’s going to be good for it or otherwise. “We’re only four rounds in, it’s so difficult to get a sample size on that just yet. It’ll settle itself down over the journey but that’s why no one really knows where they’re at right at this point in the season.